Silver pendant with zircons. 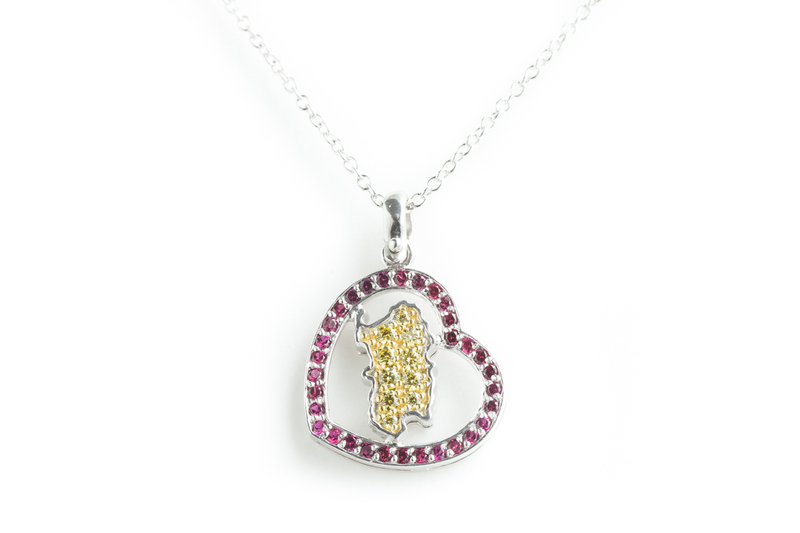 It features a small Sardinia enclosed in a heart. The artefact is part of the Chelos collection, a delicate tribute to this land. 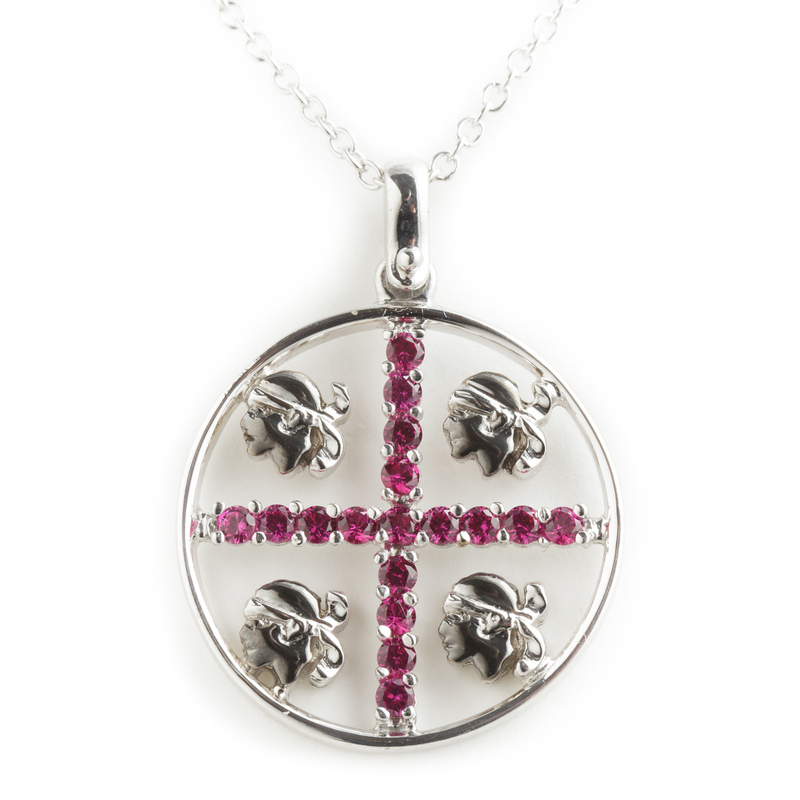 Silver pendant with zircons. Sardinia is represented by the image of the four moors. This elegant pendant has relief effects realised in filigree with contemporary stylistic taste and composition. 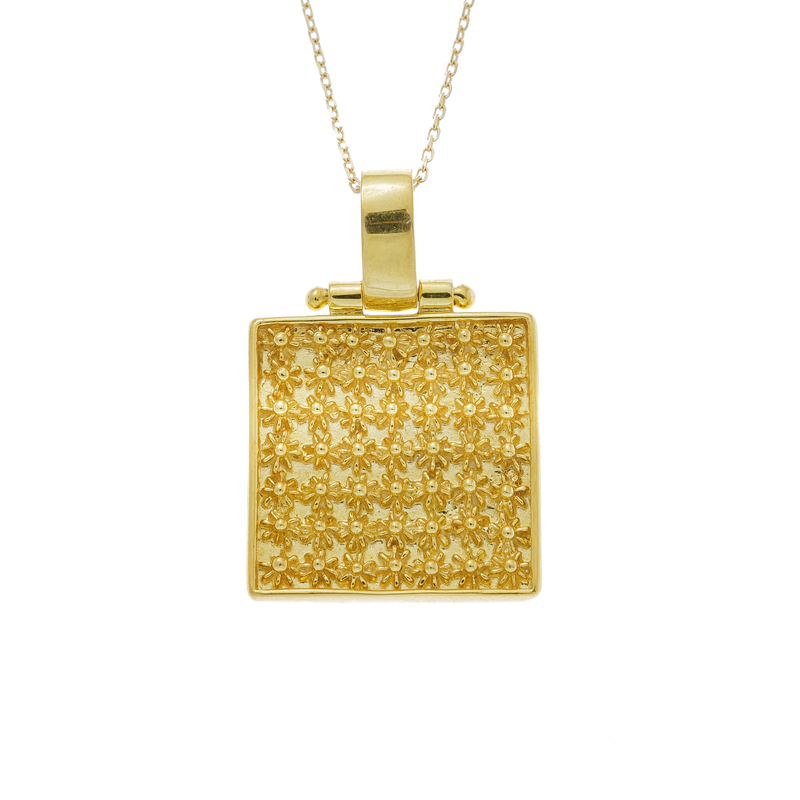 Made in silver with a special coating in pure gold, this prized pendant sensitively evokes local tradition. 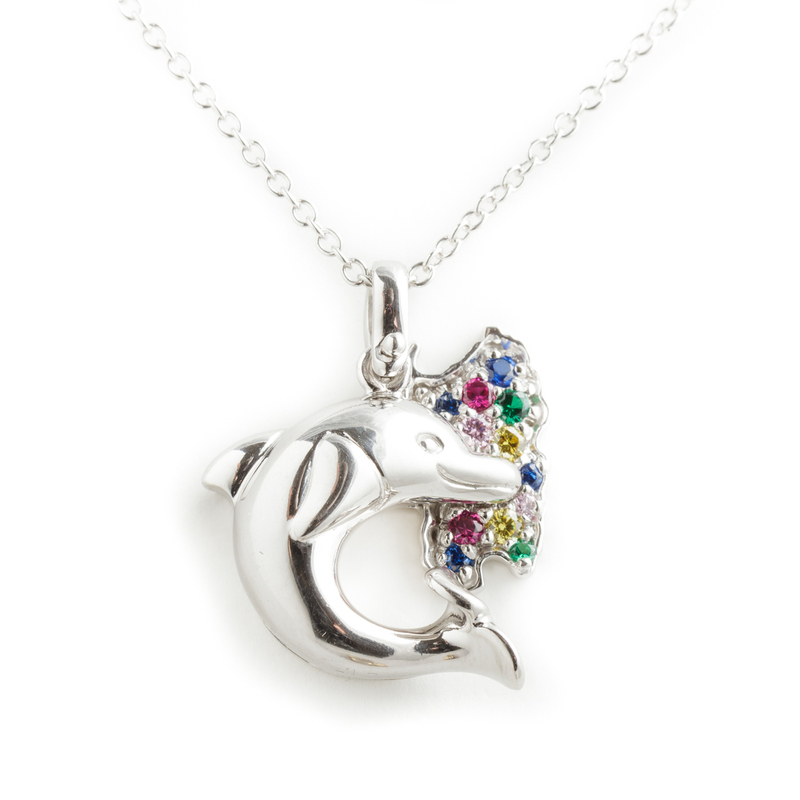 Silver and zircon pendant displaying a cheerful image of a dolphin. 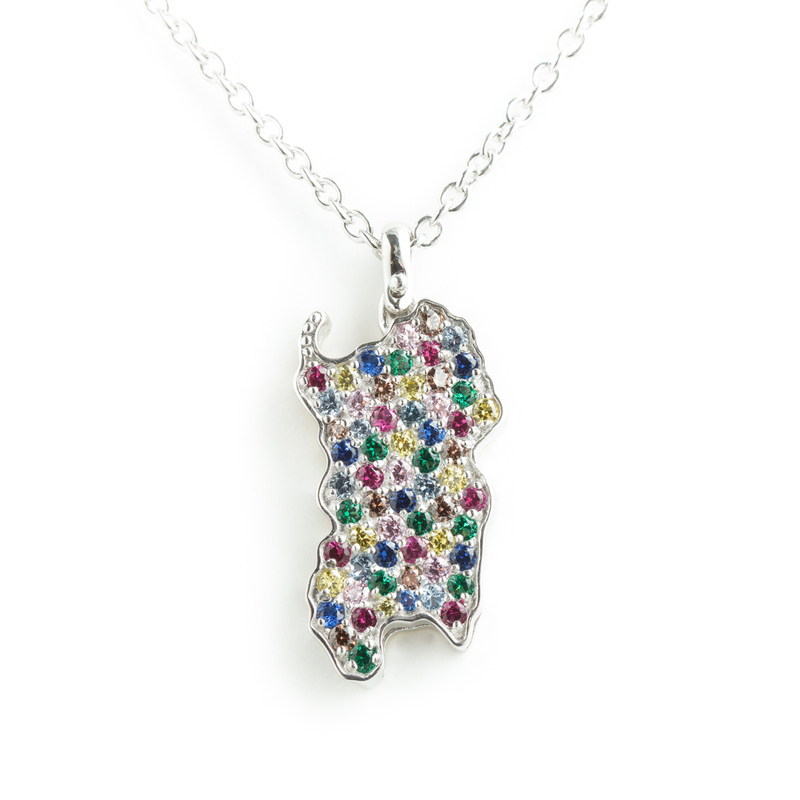 It belongs to the Chelos collection, and it is intended as a tribute to Sardinia. Cagliari-born Marco Favaretto gained his professional experience out of Sardinia. He worked at a prestigious goldsmith's workshop in Paris and learnt classical techniques, specializing in the manufacturing of fine jewellery. After several years of apprenticeship, he moved to Valenza, the most important center of goldsmith's production in Italy, where he opened his own workshop, working for major international clients. The bond with his land was, however, still very strong, so in 2013 he decided to come back to Sardinia and moved to Orosei, where he currently works. In his studio he transfers the experience and skills gained into his own collection of jewels, featuring a fine and personal touch, expressing his love for his land. In the Chelos collection, the shape of Sardinia becomes a decorative element of pendants, rings and bracelets. The use of zirconia and colorful semi-precious stones characterize his collection, made with great attention to details. He also crafts unique pieces, prepared with skill and expertise, designed for a refined and demanding group of clients. The manual techniques of classical goldsmith's art characterize the production available at his workshop, made with skill and competence. Peculiar technical procedures (palladium and rhodium-based) characterize his silver artefacts, which do not become darker over time, keeping their bright and brilliant surfaces.